This beautiful landscape has been painted by Ye. Funtusova. 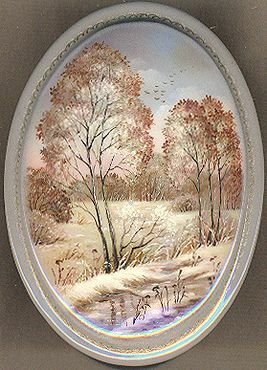 Here the artist depicts the thrilling state of nature, a sudden change of seasons. The first snow has fallen covering the green tops of the trees. Somewhere green grass peeps out from the deep snowdrifts. The surface of the river reflects the sun rays that are still warm. Blue, gray and white tones dominate this scene. Aluminum powder is used to highlight the snow covering the ground in the foreground. The exterior of the box is covered with gray oils that tone with the composition painted in the gray bluish shades. Elegant gold ornamentation accented with white oils frames the composition. The sides of the box are decorated with more complex designs composed of snowflakes. They are also painted in gold and accented with white oils. The box's interior is traditionally red. The box is made out of paper-mache. The lid is hinged from the left of the composition. The box sits flat. It is signed with the artist's name, and the village of Fedoskino.